I’m yet to meet anyone that doesn’t love Jelly Slice, especially this easy Thermomix jelly slice. It’s a dessert that’s been loved for generations, and I’m not sure that will ever change. Jelly slice is just the perfect combination of textures and flavours. From the crispy, buttery biscuit base to the creamy, tangy middle layer and finally everyones favourite, the jelly layer. When it comes to the jelly layer, I used strawberry when I made this particular batch, but any flavour works so just choose your favourite! Jelly Slice has always been on of those recipes that’s quick and easy to make. It involves absolutely no baking, and for such a tasty slice doesn’t take too much effort to put together. 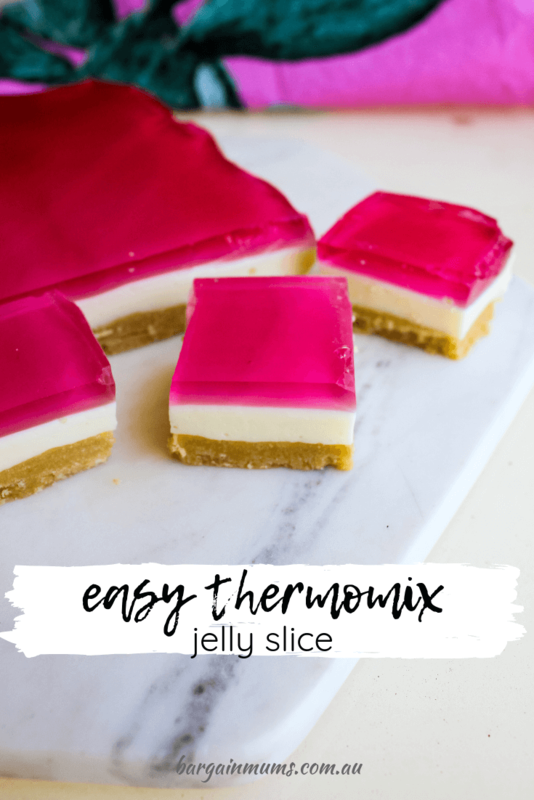 While Jelly slice has always been an easy dessert, this easy Thermomix jelly slice makes it even easier. Not only does the Thermomix do the hard work for you, but there is less washing up at the end. It’s a win-win. Don’t worry if you don’t have a Thermomix and are using one of the budget friendly alternatives to the Thermomix instead, I made this batch in my Kogan Thermoblend and it worked perfectly. If you don’t have a thermo-machine, here is our traditional easy jelly slice recipe. To make the easy Thermomix jelly slice, first line a slice tin with baking paper and set aside. Make the jelly according to packet instructions, and set aside to cool while you make the bottom and middle layers of the slice. While the jelly is cooling, add the entire packet of biscuits to the Thermomix bowl and crush for 5 seconds on speed 9. Add the butter to the biscuits and melt the butter for 3 minutes on speed 2, 80c. Transfer the biscuit mixture to the lined slice tin and press down firmly with your fingers or the back of a spoon. Place in the fridge to begin setting while making the middle layer. To make the creamy middle layer, combine the boiling water and gelatine powder and stir with a fork until the gelatine has completely dissolved. Add the lemon juice and entire can of sweetened condensed milk the a clean Thermomix bowl, and set to 45 seconds, speed 4. After 5 seconds has lapsed on the Thermomix timer, remove the measuring cup and pour in the gelatine mixture. Pour the creamy layer over the biscuit base, and place back in the fridge until set, which should only take 10-20 minutes. Once the middle layer is firm enough, pour over the cooled jelly mixture and place back in the fridge until set. Slice and serve once completely set. Line a slice tin with backing paper. Set aside. Make the jelly according to packet directions. Set aside to cool. Add the biscuits to the Thermomix bowl and crush for 5 seconds, speed 9. Add the butter and melt for 3 minutes, 80c, speed 2. Transfer the biscuit mixture to the lined slice tin and place in the fridge to set while making the creamy layer. Combine the boiling water and gelatine powder and stir with a fork until the gelatine is completely dissolved. Set aside. Add the lemon juice and sweetened condensed milk to a clean Thermomix bowl and combine for 45 seconds, speed 4. After 5 seconds has lapsed on the Thermomix timer, remove the measuring cup and pour in the gelatine mixture. Pour the mixture over the biscuit base and return to the fridge to set (around 10-20 minutes). Once the middle layer has set, pour over the cooled jelly and return the fridge to set. Slice and serve once set.